What Can You Do to Fix Wrinkles While Putting Up Wallpaper Murals? Wallpapering is an exciting way to change the decor of your tired walls. Wallpaper murals use computer technology to create enlarged images on sections of wallpaper. Murals can give your plain rooms atmospheric depth and creative interest. The poster-sized sections fit together to create one entire image. Sometimes, wrinkles may occur as you place your mural on the wall. To avoid wrinkles, specific wall preparations and hanging techniques need to be followed, although fixing the wrinkles is an option. 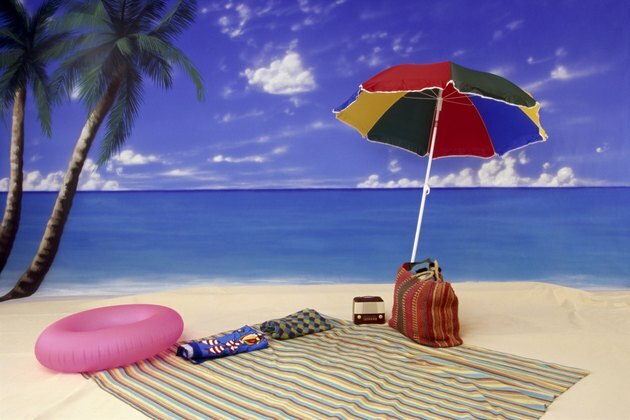 Photographic wall murals can add character to a room. Follow wall-preparation steps and wallpaper mural hanging instructions to avoid wrinkles. Holes must be repaired and walls must be smooth and clean. After measuring and marking the wall for mural section placement, start hanging the first section from a bottom corner. Following these tips will reduce the possibility of wallpaper mural wrinkles. Smooth each wallpaper mural section with a wet sponge or a soft roller to remove wrinkles that appear as you begin your application process. Be careful not to crease the paper as you place it on the wall. Press a large putty knife along the edges of your mural where it meets the other walls, floor and ceiling to remove wrinkles and pull the sections flat. When you remove the wrinkles in this manner, remember to keep the sections overlapped by about 2 millimeters to accommodate shrinkage that occurs during drying. Cut any overhanging edges with a sharp razor knife, and smooth the mural again with a sponge or roller. A perfectly fit mural with repeated smoothing or rolling will usually fix any wrinkles that were formed during the hanging process. Make small razor cuts along pattern lines near stubborn wrinkles on your wall mural. Cutting along the pattern lines will lessen disruption of the pattern when you look at it. Peel back the wallpaper at the cut lines. Apply extra adhesive to the small areas that you have peeled from the wall.